ORGAN PEDAL Playing: Is It Better To Play With Organist Shoes Or With Socks? Have you experienced problems playing the organ with organist shoes? Is it easier for you to play with socks on? In this article, I will give you tips and advice on how to overcome this challenge. It seems to me the following issue is making the difficulty in playing with the shoes the pedals for you. You are used to playing without shoes. Socks are more sensitive and therefore you might think it is better without shoes but when it comes to playing with heels, you really need shoes. Although the sole of the organist shoes is not thick but comparing to the socks, you still run into problems feeling the surface of the pedalboard. In other words, when you have to press the pedal, it is actually easier to feel it without the shoes on. However, organ pedal technique consists of using both toes and heels (at least in modern legato organ school). Therefore, using heels is a lot easier by playing with organist shoes. Technically speaking, the higher the heel of the shoe, the less motion you have to do from your ankles. I have seen great French ladies organists play impeccably on the pedals with high heels. Of course, the accuracy comes from correct practice but for most people, the heels should be around 3 centimetres or 1.2 inches. 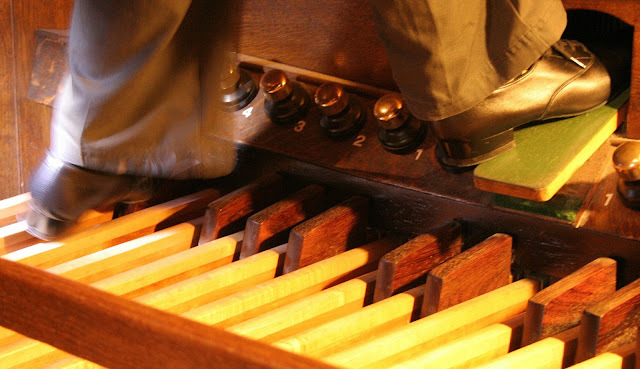 If you are experiencing problems playing with organist shoes, start practising with your organ shoes on any organ regularly (at home, on your teacher's organ or at church). Don't worry at all about the mistakes. They have to occur since you are not used to playing with shoes. Be persistent and you will discover gradual improvement over time. When you make a mistake, go back a few measures, correct it and play fluently at least 3 times in a row very slowly. Also, make use of pedal preparation technique which will automate your pedal playing.